5-Hour Energy is a great go-to shot to help boost your energy levels and to help make it through the day. But, is the 5-hour energy shot safe to consume? B6: This vitamin is found in lots of foods. It helps by producing amino acids and is part of many important chemical reactions in the body. Vitamin B12: This vitamin is involved in a variety of important bodily functions including the production of amino acids and the processing of carbohydrates into energy. Niacin (B3): Helps convert fats, carbohydrates, and proteins into energy. It is naturally found in a wide array of foods. Folic Acid (B9): Folate — also known as folic acid — helps to make and maintain new cells in our bodies. Citicoline: Citicoline is a water-soluble compound essential for the synthesis of phosphatidyl choline, a constituent of brain tissue so it can play a role in neuro-transmission and can help support brain function. Tyrosine: Naturally found in dairy, fish, meat, and grains, tyrosine is an amino acid that transmits nerve impulses to the brain. Phenylalanine: Found in dairy, avocados, nuts, leafy veggies, and more, phenylalanine is another essential amino acid. This one, though, enhances alertness. Taurine: A naturally occurring chemical substance found in meat, fish, and dairy. In the body, it can be found in skeletal muscles, the heart, white blood cells, and the central nervous system. Taurine helps with digestion and processes some minerals in the body. Malic Acid: Found in apples, malic acid is synthesized during the process of converting carbs into usable energy. Glucuronolactone: This is a natural metabolite in the human body. It is produced when glucose is metabolized in the liver and can reduce sleepiness. 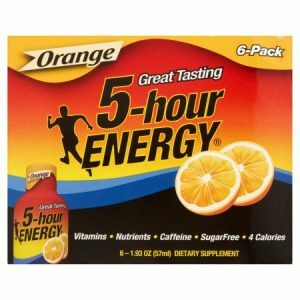 Caffeine: 5-Hour Energy's website says that each 5-Hour Energy shot contains the same amount of caffeine as a normal cup of coffee. As most of us already know, caffeine can make us feel a boost of energy and a higher level of alertness. However, high levels of caffeine can cause some negative side effects like nervousness, trouble sleeping, nausea, vomiting, rapid heartbeat, and elevated blood pressure. While none of the individual ingredients in the 5-Hour Energy shot looks troubling, always remember: "everything in moderation".